This is probably one of the most famous petroglyph panels around. The Great Hunt Panel in Cottonwood Canyon, a side canyon of Nine Mile Canyon, is an incredible display of Fremont petroglyphs. 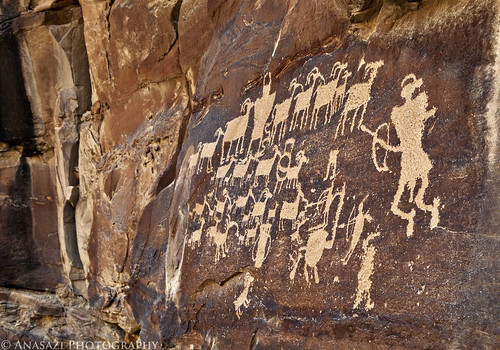 One theory about this panel is that the horned anthropomorphic figure near the middle and top of the panel may represent a hunt shaman with a herd of bighorn sheep during a migration and that the lines connecting all of the figures may represent consanguinity. Whatever the possible meaning behind this panel, the fact remains that it is a must-see site for any rock art enthusiast!